A perfect example of these exoskeleton-style robots comes from Nagoya University in Japan and is a one-handed power suit made for the very specific task of helping construction workers fit ceiling panels. 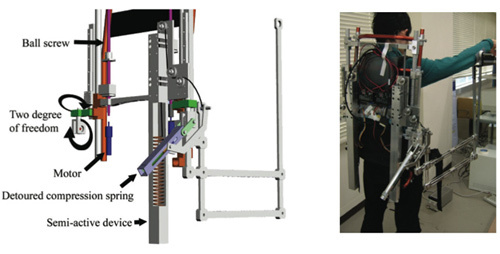 The team behind the Wearable Robot for Assisting Carpentry Workers [PDF] created the machine to address the problem posed by trying to hold a heavy panel aloft with one hand while riveting, screwing or nailing it in place with the other. What they came up with looks like half a Terminator robot that can easily be worn when working, but which does all the heavy lifting. In operation, the workman simply has to use his own strength to guide the panel into position, after which the machinery kicks in automatically to hold it in place for fixing. Test results have shown that the device does indeed make life easier for the human operator, so the team hopes to slim it down further before moving towards a finished version.